Place the washed rice in a small pan with the coconut milk, 165ml water (refill the coconut milk tin) and a pinch of salt. Bring to the boil and simmer gently for 10 minutes. Cover and set aside. Preheat the grill to high. Combine the turmeric, remaining chilli, ginger and 1 tbsp oil. Season, spread the mixture over the fillets and grill on a foil-lined baking tray, for 2–3 minutes on each side. Heat the remaining oil in a frying pan and gently cook the salad onions and the remaining dill for a minute or two with a pinch of salt, until they wilt and release their aromas. 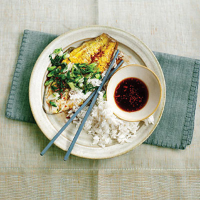 Spoon over the fish and serve with the coconut rice and the sauce spooned over or on the side.